Serena Williams bowed out in the second round of the Cincinnati Masters on Tuesday, as Carolina Garcia progressed from a demanding tie and Karolina Pliskova ended a long losing record. Petra Kvitova had too much for Williams to deal with at the WTA Premier 5 event, as the American great continues to ease her way back into regular elite competition. Garcia, meanwhile, was at risk of an upset in her meeting with a former winner in Ohio, while Pliskova finally got the better of a long-term rival. Kvitova had to dig deep to prevail against Williams, the Czech winning 6-3 2-6 6-3 after two hours on the outdoor hard courts. 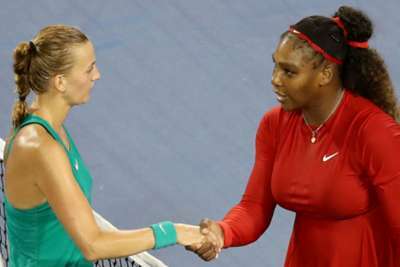 "It's always a pleasure to share a court with her [Williams], I'm just happy I did well today," Kvitova said in an on-court interview. Fifth seed Svitolina also endured a gruelling encounter with Svetlana Kuznetsova late in the day, the Ukrainian eventually prevailing 7-6 (7-1) 4-6 6-4 after two hours and 43 minutes. Sixth seed Garcia recovered from falling a break down in each set to overcome 2013 champion Victoria Azarenka 6-4 7-5 and progress to the third round. "I was expecting a big fight like this. Her ball was coming very fast ... and I was just trying to react as fast as I could and just put one ball in. She's not number one like she used to be, but you can see she had a lot of tennis behind her," Garcia said. It's a bird. It's a plane. It's Super @CaroGarcia! Pliskova, the 2016 champion, defeated former world number two Agnieszka Radwanska for the first time in eight attempts. Seeded ninth this week, Pliskova overcame her Polish opponent 6-3 6-3, breaking her three times in the first set and once in the second. "I think the match was under my control," the Czech world number eight told a post-match press conference. "She had a couple of break points, but even if she would break me I still felt like I'm the better one today." Daria Kasatkina, seeded 12th, was one of the few high-ranked players to suffer an upset on Tuesday, Petra Martic winning their match 4-6 6-4 6-3. Seeds Elise Mertens (15) and Ashleigh Barty (14) overcame Magdalena Rybarikova and Marketa Vondrousova respectively in straight sets. The hopes of the host nation took a hit though, Coco Vandeweghe, Varvara Lepchenko and Allie Kiick all bowed out, with Amanda Anisimova the only American to progress on Tuesday.